Eating primarily plant-based foods can require more meal planning to meet your protein needs if you’re weight training regularly. Maintaining a healthy diet and lifestyle doesn’t mean you can’t enjoy the occasional sweet treats! I added whey protein and shredded apples to these oat chocolate chip bites to give an extra protein boost in my diet, even when enjoying dessert. These two-for-one cookies are low in added sugar and are packed with protein, alpha-linolenic acid (important for heart and brain health) and phytonutrients like beta glucan to make them (almost) guilt free! Adding flax meal may also help lower cancer risk. 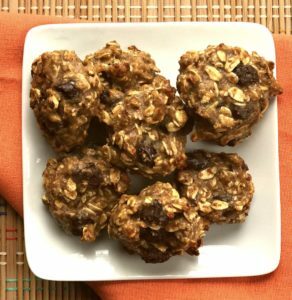 Mix ½ cup oats, flax meal, almond butter, protein, vanilla extract, cinnamon, maple syrup, and chocolate chips in a large bowl. Stir in the shredded apple until mixture is runny. Fold in remaining 1/3 cup of oats. Use a tablespoon to scoop and roll into balls. Keep a bowl of cold water close by to use if the mixture sticks to your hands. Place on a silicon baking mat-covered cookie sheet or parchment paper. Bake at 300 degrees F for 10 minutes. Flip balls over and continue cooking for another 2 minutes or until golden brown (if you flip too early, the balls will lose their shape and the chocolate will run out of the cookie). Let balls cool, then place in freezer. 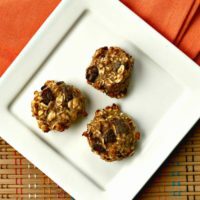 Enjoy these protein bites straight out of the freezer. They are both soft and crunchy, the perfect texture! Total Servings: makes 18 balls.